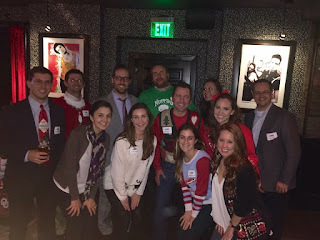 The Young Risk Management Association, North Texas Chapter, (YRMA) partnered with Bryan’s House on December 3rd for its annual Tacky Sweater Party to help raise funds toward its mission. American Receivable donated items to the event in order to help YRMA raise money for the organization. All proceeds of the event went to Bryan’s House. Attendees also had the opportunity to bring unwrapped toys as well as sign up to volunteer at Cookies for Santa on December 5th. The mission of Bryan’s House is to serve children with medical or developmental needs and their families by providing specialized child care, respite care and social services. The Risk Management Association (RMA), founded in 1914, is a not-for-profit, member-driven professional association serving the financial services industry. Today, RMA has approximately 2,600 institutional members. These include banks of all sizes as well as nonbank financial institutions. Chapters are run by RMA Associates on a volunteer basis and they provide members with opportunities in their local communities for education, training, and networking throughout all stages of their financial services career. YRMA is the division of RMA which consists of early career individuals to help raise awareness about RMA and provide young professionals in the risk community a chance to network with each other. Tiffany Strasner, Vice President of Business Development for American Receivable Corporation is an active board member.